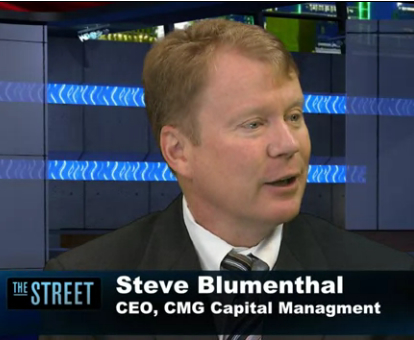 Tactical investing is about planning to accomplish a purpose, says Steve Blumenthal, CEO of CMG Capital Management Group during a recent interview on theStreet. “We speak and work with hundreds of financial advisors,” Steve tells Gregg Greenberg in theStreet’s Wall Street studio. He explains CMG’s tactical investing strategies, and the framework of the CMG Global Equity Fund (GEFAX). You certainly want to have long equity exposure, but you want to hedge in these uncertain times, says Steve. “Japanese Yen still a clear short,” Steve says, and he mentions a Pro Shares ETF that can used to accomplish that strategy. Click here to take a look at the full clip from Steve’s conversation with Gregg Greenberg of theStreet.com. 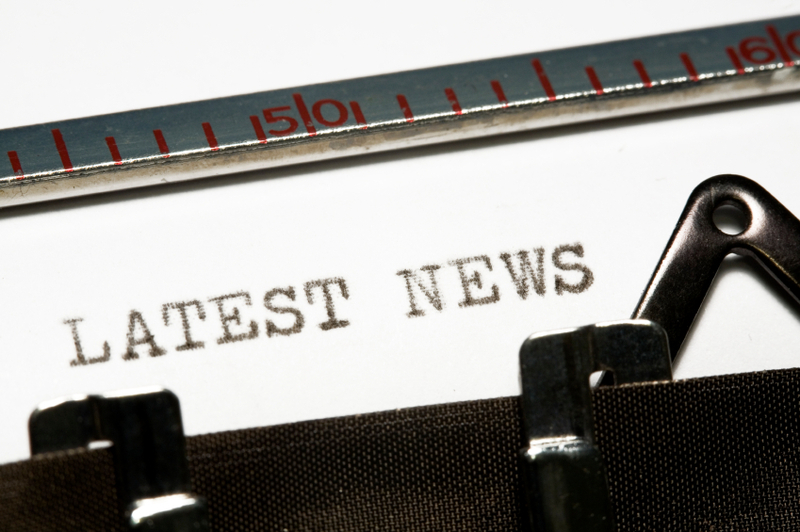 See more CMG Capital Management Group News. Steve Blumenthal, CEO of CMG Capital Management Group, talked to Gregg Greenberg at theStreet in New York yesterday (video below). 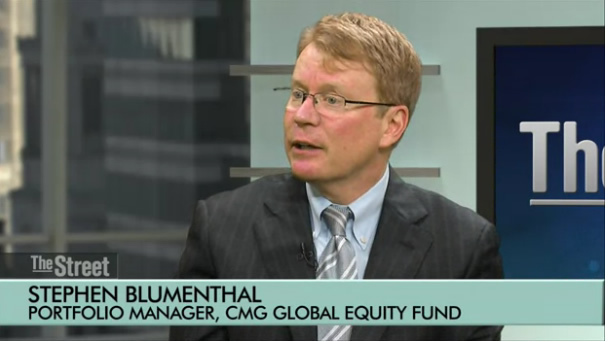 The market is overvalued by 20% after last year’s rally and bond yields remain at record lows, so the traditional 60/40 stock/bond split is not optimal, says Blumenthal, portfolio manager for the CMG Global Equity Fund. Blumenthal says a better way to allocate assets is 33% in stocks, 33% bonds and the final 34% in a tactical trading portfolio. His most recent tactical trades are going long the SPY and TLT exchange traded funds, as well as the Pro Shares Ultra Short Yen ETF. The U.S. equity market (represented by the Russell 3000® Index) started strong, up 11%, buoyed by improvement in the labor market and positive housing data. Returns varied across asset classes and sectors in the first quarter of the year. See the Russell Investments First Quarter Market Review: Strong Start, What’s Next. Writes Miguel Perez-Santalla on PreciousMetalsLife.com: “With the recent drop of the precious metals prices and the continued media negativity on gold one would think that the public would be selling. However, the BullionVault exchange, with over 46,000 customers, has experienced double its usual activity in recent weeks with net buyers of both silver and gold. I believe this is an indication of the lack of confidence that the public has in our recovery.” See Unemployment Surprise! Gold in Recovery. The world remains uniquely out of balance. It’s critical to focus on risk management now. See On My Radar: Thoughts on Cyprus & France by Stephen Blumenthal, CEO of CMG Capital Management Group. With the April 15 deadline for filing tax returns fast approaching, financial advisers face a deluge of tax returns involving substantial gifts — a vestige of clients’ giving spree due to their tax uncertainty late last year. See Giving spree seen complicating taxes by Darla Mercado, InvestmentNews. National Advisors Trust Appoints New CEO. National Advisors Trust Company is the largest independent, RIA-owned trust company in the nation with more than $8 billion in assets under administration. James Combs Jr. has been named CEO. Combs was previously chief operations officer for SEI Investment Manager Services. Combs also held numerous executive positions at Wilmington Trust Company, Wachovia Operational Services Corporation, Global Processing Alliance and Bankers Trust Company. TD Ameritrade Institutional Names Director of Advisor Transitions. Scott Collins was previously CEO of FirstPoint Partners and SVP of business development at LPL Financial .